One look at the jaw-dropping image quality possible with the D810 and you'll never look at image quality the same way. The level of detail and sharpness, the wide dynamic range and rich tonality in nearly any light is simply staggering - almost unimaginable until now. For still and multimedia photographers including landscape, studio, wedding and portrait pros, the D810 will ignite your creativity and help you capture images that astound. For cinematographers and camera operators, the D810 will become one of the most versatile and important tools in your arsenal. With meticulous autofocus, fast frame rates and image processing, smaller file formats, excellent energy efficiency and exciting new capabilities for all manners of shooting, the D810 expands your vision and lets you rethink what's possible. The D810 truly raises the bar for image quality and dynamic range. An all-new FX-format full-frame image sensor design - 36.3-megapixels with no optical low-pass filter - is paired with Nikon's innovative EXPEED 4 image processing for flawless detail retention from snow white to pitch black, beautiful noise-free images from ISO 64 to ISO 12,800, an extremely wide dynamic range, flattering well-saturated skin tones and much more. The combination reveals the true optical precision of NIKKOR lenses, which provide flawless rendering even at these pixel counts. For those seeking the ultimate in D-SLR image quality, the D810 delivers. The D810 performs with astounding speed and precision. Capture 5 fps at full resolution and in 5:4 crop mode, 6 fps in 1:2 crop mode and 7 fps in DX-crop mode*. 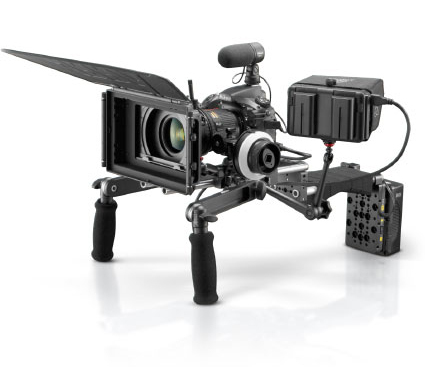 Enjoy tack-sharp focus -crucial in high-resolution images - thanks to an Advanced Multi-CAM 3500FX AF sensor that uses 51 focus points, including 15 cross-type sensors, 11 of which work all the way to f/8, plus a new Group Area AF. Internal vibration has been nearly eliminated with a newly designed sequencer mechanism and Electronic Front Curtain Shutter system. You can even quickly spot-check your focus by zooming in 46x on the large 3.2-inch 1,229k-dot display with RGBW alignment and monitor highlights during video capture with zebra striping right in the display. The D810 is as nimble as it is precise. 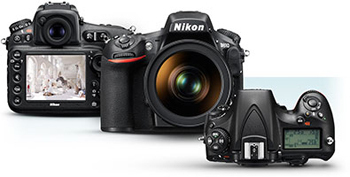 The D810 is a versatile camera for versatile shooters. 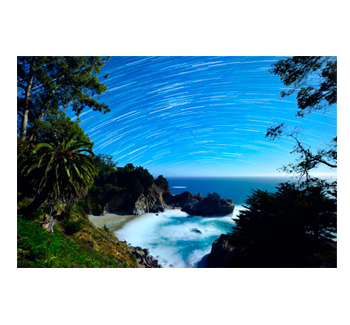 Produce stunning star-trail images with unlimited continuous shooting - capture images for as long as your battery or memory card will allow. 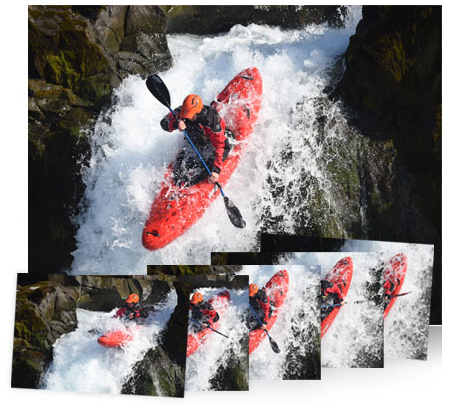 Create smooth, even time-lapse sequences thanks to new Exposure Smoothing. Preserve details in both the shadowy and bright areas of stage performances and other spot-lit situations with Highlight-weighted Metering. Use the D810's pop-up flash as a Commander for Nikon's Creative Light System - a major convenience for location photographers. Save your files in a new 12-bit uncompressed RAW size S* format that's half the size of RAW size L. Wherever your passion and inspiration takes you, the D810 will follow. Nikon's EXPEED image processing concept enables superior performance in Nikon cameras. The new EXPEED 4 design takes that performance even further - 30% faster than its predecessor, 25% faster frame rates (5 fps), a wider ISO range of 64-12,800 with low noise throughout, smooth gradations, a wide dynamic range, optimizations for 1080 60p video, greater energy efficiency and more. Every superb NIKKOR lens tells a new story, from fast primes to versatile telephoto zooms. With optional Nikon Speedlights, lighting is as powerful and comprehensive as you want it to be, while pro-grade Wi-Fi transmitters and remote controls streamline workflow in the studio or at a remote location. Draw the most from RAW files with the new Capture NX-D software, or tailor your images and customize your picture control settings with the optional Picture Control Utility 2. Unleash the full potential of the D810.